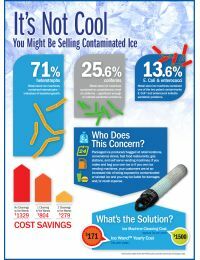 Dirty conditions in ice machines are a major cause of ice contamination. This can lead to poor taste, foul odors, murky and/or discolored ice cubes, and shortened machine life. 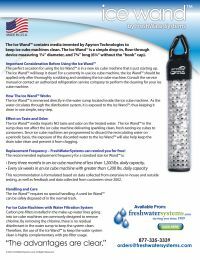 These conditions can easily be avoided by using the Ice Wand™ system. Do not be fooled by imitators such as Ice-Guard Slime Control System, Nu Calgon's Ice Guard AP™ or Selecto's SlimeGuard™ as these are not nearly as effective or cost efficient. Eliminates Ice Contamination. The patented antimicrobial media used in the Ice Wand™ practically eliminates bacterial growth in your ice machine, minimizing the otherwise expensive and labor intensive maintenance requirements of having an ice machine. Prior to installing the Ice Wand™, clean and sanitize the interior of the ice machine completely. Place the Ice Wand™ directly into the ice machine sump (water holding tank) and fasten according to instructions.